You might find places of worship belonging to different religions in close neighborhoods and sometimes even on the same street or line. This is quite fascinating and further solidifies the cultural diversity of the country. 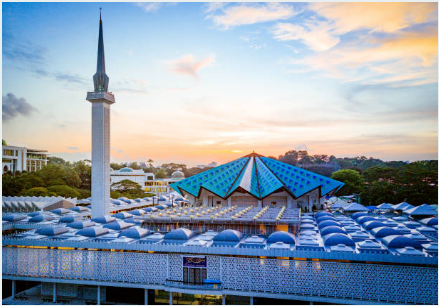 An inbound travel agent in Kuala Lumpur Malaysia would always include the religious attractions in your itinerary as they are not only magnificent architectures but also have a great story behind their constructions. One of the most visited temples by the Indian immigrants, Sri Mahamariamman Temple has now become an important national and cultural heritage site. Sitting at the edge of Chinatown this temple is the oldest and richest Hindu Temple in Kuala Lumpur and is dedicated to Hindu deity, Mariamman, considered a protector of Tamils during their sojourns to foreign lands. The temple encompasses the main prayer hall with a decorated ceiling telling tales of Hinduism, three main shrines within the main temple and four smaller shrines located peripherally around the main temple building. The shrines have been dedicated to Lord Ganesha, Goddess Lakshmi, and Lord Murugan among many others. The temple is adorned with precious stones, gold as well as Italian and Spanish tiles. However, the most remarkable feature of the temple is the top tower or the ‘Gopuram’. The gopuram was sculpted by experts from South India and flaunts a total of 228 Hindu idols carved into it, recreating scenes from Indian epic, Ramayana. Look out for a beautiful silver chariot in the main prayer hall dedicated to Lord Murugan. The silver chariot is embellished with 240 bells and a pair of horses. The beauty of the temple is a classic example of a grandiose structure and intricate architectural beauty. Address- 163, Jalan Tun H. S. Lee, Kuala Lumpur. 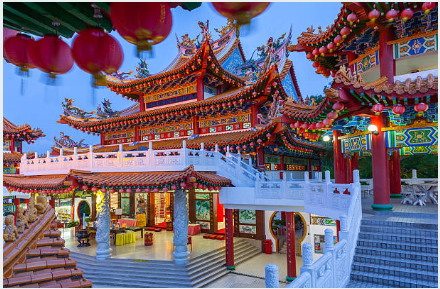 One of the largest and the oldest Chinese-Buddhist Temple in the whole of South East Asia, the six-tiered Thean Hou Temple is known as the Temple of the Goddess of Heaven and is one of the must-visit religious places in Malaysia. The temple is dedicated to Goddess Tian Hou, the Goddess said to protect fishermen, Guan Yin, the Goddess of Mercy as well as Shui Wei Sheng Niang, Goddess of the Waterfront. Perched atop Robson Hill, the temple has a serene atmosphere and offers a spectacular view of the city. The front entrance of the temple is a multi-arched gateway with red pillars that signifies good fortune and prosperity along with dragon inspired columns and pagoda rooftops. The inside of the Thean Hou temple is in the likes of a modern Buddha pagoda and the halls are enshrined with the images of Buddha. The magnificent temple incorporates within its vicinity a Chinese medicinal herb garden, tortoise pond, well, and a sacred Bodhi tree. The temple has been built with intricate embellishments and ornate designs which is a mix of contemporary and traditional. It is a great example of the architectural beauty of traditional China with elements of Buddhism, Taoism, and Confucianism infused into the majestic structure. A popular tourist attraction in Malaysia, Batu Caves Temple is one of the main attraction for the Hindu crowd that visit Malaysia. The Batu Caves consist of three main caves which are devoted to various Hindu gods. You need to climb a total of 272 steps to reach the caves. One of the main attractions in the Batu Caves is the 42.7m tall consecrated statue of Lord Murugan, a favorite among the Tamil gods, which has been constructed in front of the cave. Interestingly the entrance of the main cave is in the shape of Lord Murugan’s spear, a reason which inspired the erection of the statue. The caves are a great attraction for the tourists during the Hindu Thaipusam Festival, a major Hindu Festival in Malaysia. Another reason for visiting the Batu Caves is the magnificent skyline view from the top of the steps. Batu Caves Temple is one of the most renowned Hindu Temples outside India and is a must visit for all the tourists. Known as the National Mosque of Malaysia, Masjid Negara is the nationwide symbol of Islam in the country. The blue-hued mosque was built in 1965 to celebrate the attainment of Malaysia’s independence. The mosque is spread over a distance of over 13 acres and is able to accommodate over 15000 devotees. The design of the mosque is a mix of contemporary and traditional with geometric, abstract as well as intricate designs reminiscing the Grand Mosque in Mecca. The architecture consists of 73 m high minaret, a 16 pointed star main roof, 48 smaller domes, and the main prayer hall. The main dome of Masjid Negara is in the shape of the star with 18 points symbolizing the 5 pillars of Islam and the 13 states of Malaysia. The Grand Hall within the mosque contains perhaps the most intricate of all designs as the walls are decorated beautifully with the verses of Holy Quran. Masjid Negara is an absolute visit for all the Muslim inhabitants of Malaysia. Opening Hours- 09:00 – 23:00 from Saturday to Thursday and 02:45 – 18:00 on Friday. The Sin Sze Si Ya Temple is regarded as the oldest Taoist temple in Kuala Lumpur and is a great cultural center in Chinatown. The temple was erected in the honor of Tutelar deities Sin Sze Ya and Si Sze Ya. The temple consists of the main prayer hall and two smaller side halls which have been intricately carved in accordance with the Feng Sui design. The temple grounds have open-air pavilions with beautifully carved channels for lighting incense sticks during prayers. The unique feature about this temple are the two sedan chairs in the front of the temple that are over 100 years old. The temple is flocked by Chinese students during exams to kneel before the God of Education, Wenchang Dijun. The Sin Sze Si Ya temple is a peaceful place of worship in the ever-bustling area of Chinatown. Make sure to visit these tourist religious attractions in Kuala Lumpur, Malaysia. The temples and mosques are not only brilliant in their design and architecture, but each of them also has an interesting tale to tell. You can book your vacation tours through an authentic tour operator in Malaysia that would provide you with an efficient travel itinerary within your required budget. You can also contact us, GMTC is a genuine DMC and Luxury tour operator in Malaysia. We believe in providing the best for our clients so that they have amazing travel experience.